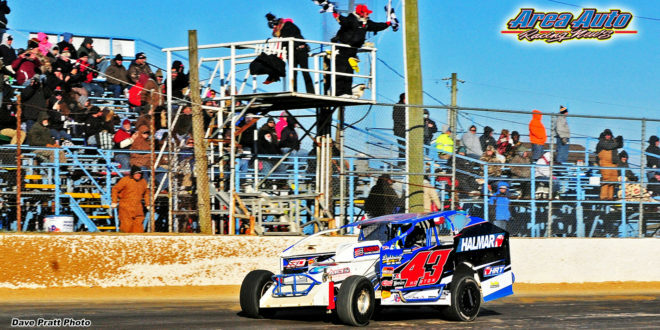 There’s a mystique about Dirt Modified driver Jimmy Horton, who by any measure is one of the sport’s accomplished, durable and well liked competitors. Ever since Horton let it slip a few years ago that he would retire at the end of his first winless season, anticipation of that first win builds annually. Last year, that was on August 27, the latest date in his career. His win this past Saturday, on March 11, tied the earliest Horton has ever won a feature in his life, coming 38 years to the day from his win in the 1979 Reading Fairgrounds opener. There is much to be said for a man who has been winning races for so long, now 44 straight years to be exact. In a sport that gravitates reflexively toward youth on a national level, Jimmy Horton’s Georgetown win is a trip back in time, a celebration of past and present glory all rolled into one. For over four decades, Jimmy Horton has been making headlines. This latest win is a Newsmaker!